Hey hey, here I am, finally back with a new spring-appropriate outfit :D If you follow me on Instagram by now, you probably know that I've been away this past weekend. This time it was all about Xi'an, a historically famous and important city here in China, which was on our list for a long time, especially due to the Terracotta Warriors & Horses Museum which is located about 40km away from the city. But I will tell you more about this in a future post. I had my eyes set on this BLOUSE ever since I saw it on the website, but it was just too cold for it. However, now that the weather got better and warmer I finally got a chance to order it and I love it so much. 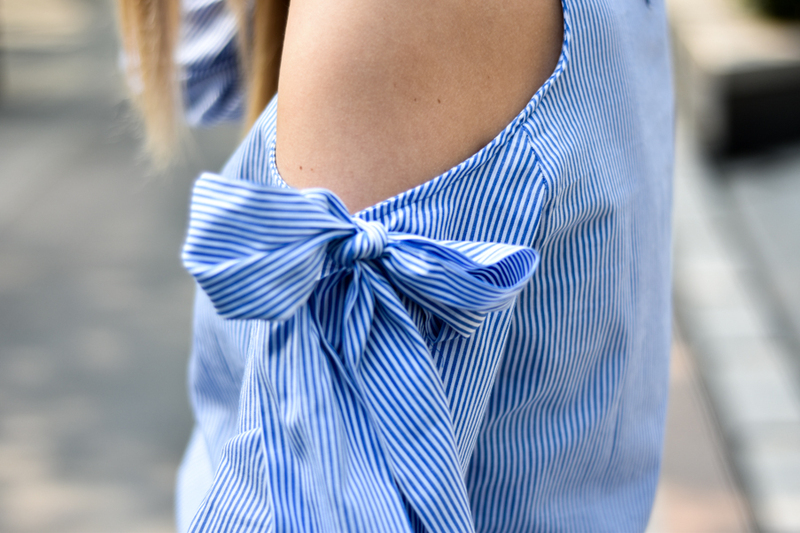 Well, blue tops with stripes are among my favourites right now, but if they also have that extra something, like a cold shoulder and bow detail it's even better. This one has it all, together with a good, shirt-like fabric which is just perfect for spring, but because it has those cut-out shoulders can be easily worn in summer as well. 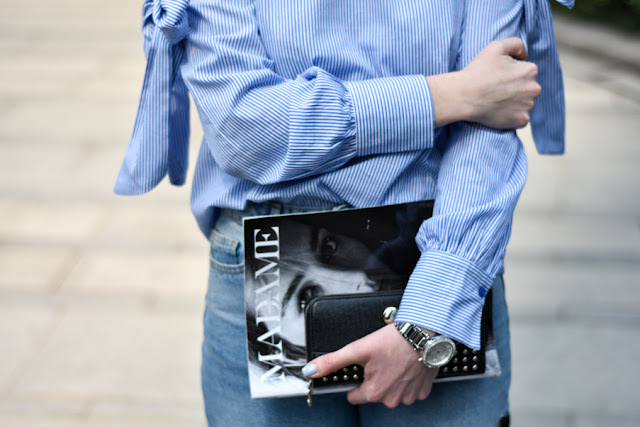 Moreover, I think it is very easy to style with a pair of jeans/pants or a skirt, maybe some shorts or culottes, it just goes with everything. This time I went for my newest pair of blue jeans, which have a black ribbon detail on the legs, ending with a bows as well. Then, I added a pair of black heels and a purse with some metallic details, but as I don't feel like adding too many accessories at the moment, I only wore a pair of silver earrings and a pair of glasses. What do you think of this look? How would you wear this BLOUSE? Such a great outfit! I'm in love with your top! Wow! Stylish and stunning outfit! 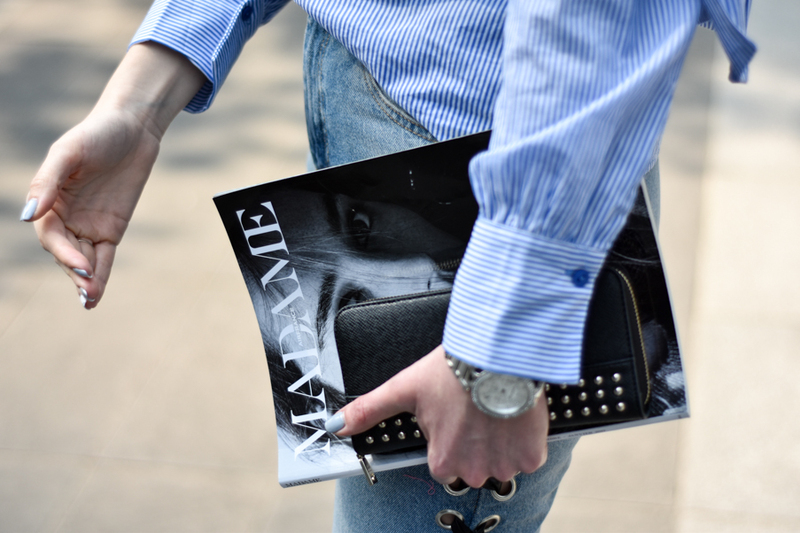 Amazing blouse! Your look is always one of the best!Love the details!